Implement support for the richer style Vega tooltips, per #17215 request. Uses Vega tooltip plugin for formatting. Always enabled unless user sets tooltips=false flag in the config.kibana section of the spec. 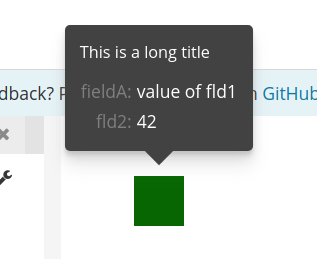 if i understand correctly, we are adding this as the default tooltip handling only shows a single value ? vega tooltip has been significantly reworked over the weekend, update coming soon. The new support will work from the tooltip channel in Vega itself, capable of showing a table or a single value. i dont think this completely matches the EUI styles ? // with a largue nmuber of tests, hence supressing eslint here. @elastic/kibana-security Could we have a validation from you, that vega-tooltip is safe enough to use for applying it's results to innerHTML? Given the context of where the escaped HTML is being input, vega-tooltip's escapeHTML function appears to be "safe enough". However, it's only escaping < and & so if vega-tooltip began using value to set attributes on HTML elements, we would be vulnerable to an XSS. We're using _.escape elsewhere to escape HTML, so i'd prefer we use _.escape instead of vega-tooltip.escapeHTML to further protect ourselves. LGTM - from the security perspective. only gave this a cursory look, but lgtm from me. verified final commit addresses security issue. no need to change, but in future I'd use typeof .... === "undefined", as it's more canonical and doesn't rely on obscure globals. Implement support for the richer style Vega tooltips, per elastic#17215 request. Uses [Vega tooltip plugin](https://github.com/vega/vega-tooltip) for formatting. Always enabled unless user sets `tooltips=false` flag in the `config.kibana` section of the spec. Implement support for the richer style Vega tooltips, per #17215 request. Uses [Vega tooltip plugin](https://github.com/vega/vega-tooltip) for formatting. Always enabled unless user sets `tooltips=false` flag in the `config.kibana` section of the spec.